Garmin has unveiled the Forerunner 935, a GPS running and triathlon watch with new performance monitoring tools and Elevate wrist-based heart rate technology. In addition to 24/7 heart rate monitoring, the Forerunner 935 includes new training features, ‘allowing users to fine-tune exercise and recovery to be a better athlete’. Paired with Garmin’s new Running Dynamics Pod, Forerunner 935 users will now be able to see all six running dynamics without the need for a chest strap. At only 49g, Garmin adds that every detail in its lightweight, comfortable design was chosen with the athlete in mind. The Forerunner 935 is being announced in conjunction with a new print, digital and social campaign featuring 13 professional Garmin-sponsored elite runners and triathletes from across the world. The campaign showcases how the dynamics offered by the Forerunner 935 help these athletes fine tune and elevate their training and be more competitive on race day. 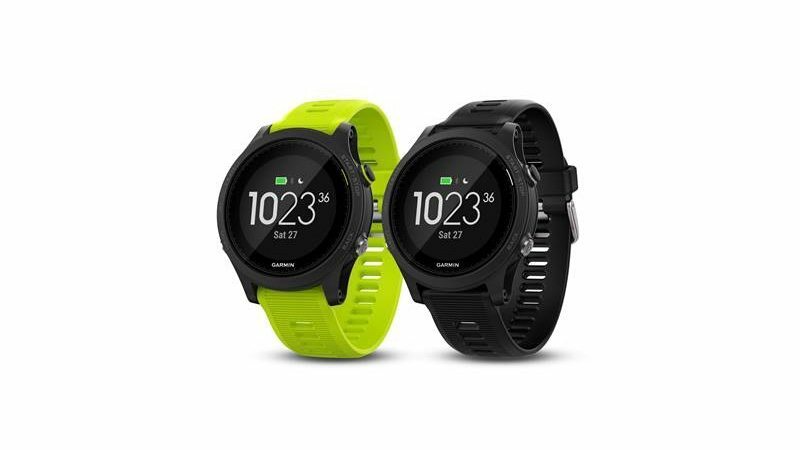 “With similar features to the fēnix 5 – our popular multisport GPS watch built for fitness, adventure and style – the Forerunner 935 is catered more towards athletes focused on performance and results,” said Andrew Silver, Garmin EMEA Product Manager, Fitness. New training features – with technology provided by First beat – make it easier for Forerunner 935 users to monitor performance and better prepare for a race or training cycle. ‘Training status’ automatically analyses previous exercise and fitness levels to provide insight into how the athlete’s body is responding – letting them know if they are training productively, peaking or overreaching. ‘Training load’ gives users an overview of their weekly activity and helps them determine if they are training in the right zone and whether their sessions are too easy or hard. Additionally, the new ‘training effect’ metric tracks and reviews the aerobic and anaerobic benefit of a training session, letting athletes know how their training is improving their ability to push their limits. With these training features available at their fingertips, Garmin notes that athletes can make adjustments and improvements to their training to become better, faster and more efficient come race day. The Forerunner 935 also allows users to go further with their running data. The new Running Dynamics Pod clips to the waistband allowing athletes to see all six running dynamics – including cadence, ground contact time, stride length and more – on a compatible device without the need for a chest strap. The Forerunner 935 also features advanced dynamics to help with cycling and swim training. While on a bike (and when paired with a Garmin Vector power meter), it will track dynamics including power zones, time seated and standing, platform centre offset and power phase. In the water, the Forerunner 935 will track distance, stroke, pace, personal records and more. With Elevate wrist-based heart rate, Forerunner 935 users have around-the-clock heart rate monitoring without the need for an additional strap. With GPS and GLONASS coverage, athletes can track their activities in challenging environments than with GPS alone. Additionally, the Forerunner 935 includes ABC (altimeter, barometer and compass) sensor capabilities. The built-in altimeter provides real-time elevation information, while the barometer can predict weather changes by showing short-term trends in air pressure. The compass can help users keep their bearings whether they’re moving or not. Athletes can transition between sports with the press of a button utilizing the auto or manual multisport feature. Additional built-in activities include hiking, trail running, skiing, paddle sports, golf and more. The Forerunner 935 is also compatible with the full line of Varia cycling awareness accessories and the Vector pedal-based cycling power meter system. Users can also track body composition data – such as weight, BMI, body fat and more – in their Garmin Connect account (through wireless syncing with the Index smart scale) along with the rest of their data. Available on the Forerunner 935, Strava Live Segments allow users to view real-time results on a run or ride, leaderboard rankings and how their current effort compares to their PR. Starred Strava segments automatically sync with the Forerunner 935 for live feedback during an activity. Purchasers of the Forerunner 935 will receive a 60-day trial of Strava Premium, and owners of Connect IQ compatible devices will receive a 30-day trial. Installed on the Forerunner 935, the new TrainingPeaks app allows users to download free workouts directly to their watch, then view the workout in real time, complete with intensity targets and interval durations. Following a session, athletes can automatically sync their completed workout back to TrainingPeaks for a detailed analysis of their performance and to measure their progress toward their goals. Users can also customize their watch with data fields, watch faces, widgets and additional apps including Uber ETA (by Garmin) and AccuWeather MinuteCast Minute by Minute Forecast in the Connect IQ store. When paired with a compatible smartphone, the Forerunner 935 automatically uploads to Garmin Connect, an online fitness community where users can track workouts, sleep patterns, join online challenges to compete against friends and earn virtual badges. GroupTrack allows users to keep tabs on those they train with, while LiveTrack lets loved ones follow along on runs and rides in real time. The Forerunner 935 features up to 24 hours of battery life in GPS mode, up to 60 hours in UltraTrac battery saver mode without optical HR and up to two weeks in watch mode. It is available in black for £469.99. A tri-bundle option – which includes a black watch face with force yellow strap, HRM-Tri, HRM-Swim, Quick Release Kit and additional strap in black – is available for £589.99. Compatible with optional Garmin QuickFit bands in leather, silicone or metal, ‘the Forerunner 935 lets users go from workplace to work out – no tools required’.